This article is to help troubleshoot issues with the Assistant button showing up on your website. Have you blocked your IP address? If you've blocked your own office/computer's IP address from contributing towards your own GoSquared stats, the Assistant button will also be blocked for you. You can check who's blocked from each project by heading to Settings > Current Project > Blocked. Just check to see if your current IP address is in the blocked list for each of your projects (sites). Users with ad & content blockers such as Ghostery, Adblock, uBlock might have problems loading Assistant on your website. In these cases GoSquared might not load properly until the blocker is disabled or GoSquared is whitelisted in its settings. Ad blockers may also interfere with Chat Prompts showing. 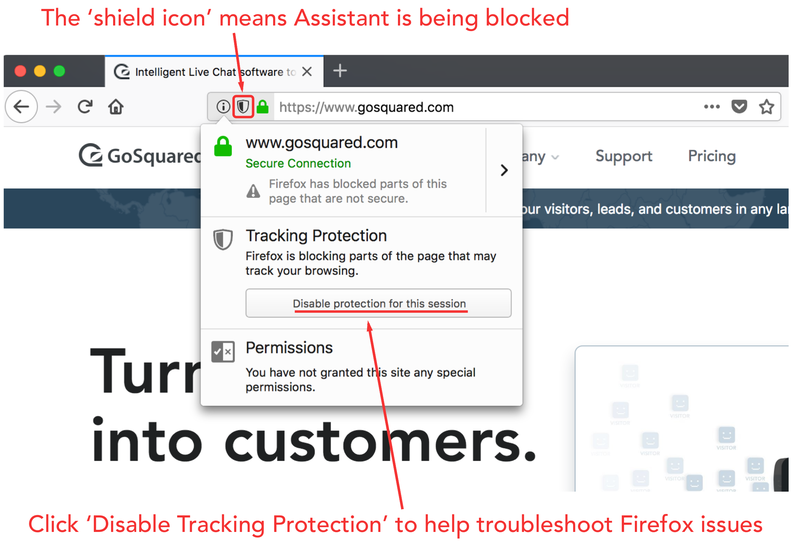 Are you using Firefox Tracking Protection? If you are using the Firefox web browser, you may have the Tracking Protection feature turned on (especially if you are browsing in a Firefox 'Private window'). This blocks Analytics providers from loading on your site and interferes with the Assistant too. You can easily spot when Tracking Protection is on because as shield icon will show up in the address bar. Why can't I see Chat Prompts? Chat Prompts will only be shown to new visitors that have never previously sent you a message. So the easiest way to check if a Prompt is working is to open your site in a Chrome Incognito window (or Safari Private browsing mode, or an Edge InPrivate). If you still can't see your Prompt, check that you haven't blocked your IP address (to stop your own site visits polluting your Analytics) in Settings > Current Project > Blocked. Learn more about chat prompt behaviour with the full guide.